Si tratta di astronomia e non di astrologia... le due cose sono ben differenti. PASADENA, Calif.--In the next decade, when scientists are able to study Earth-sized worlds around other stars, they may find that foliage on some of the planets is predominantly yellow--or orange, or red. It all depends on the color of the star the planet orbits and the stuff that makes up the planet's atmosphere. That's the conclusion of researchers from the Virtual Planetary Laboratory, a NASA-funded initiative at the California Institute of Technology, who are announcing today results from a series of comprehensive computer models for guiding the future search for plant life on other worlds. Two related papers on what to expect out of photosynthesis are being issued in the journal Astrobiology. Determining the range of possible colors is important because scientists need to know what to look for when they begin getting spectra of light from faraway Earth-sized planets, says lead author Nancy Kiang, a biometeorologist at NASA's Goddard Institute for Space Studies, and currently a visitor at Caltech's Spitzer Science Center. "The dominant color of photosynthesis could be yellow, or orange, or maybe red," Kiang explains. "I think it is unlikely that anything will be blue--and, of course, green plants are also a possibility, since that's what we have here." "What makes this study unusual is the highly interdisciplinary method by which planetary scientists, atmospheric scientists, biologists, and others have pooled their efforts in modeling the possible spectra of light available to plants on Earth-like planets orbiting around other stars," says Vikki Meadows, an astrobiologist at Caltech and lead scientist of the Virtual Planetary Laboratory. Because the study requires data about everything from the type of photons given off by a main-sequence star in a particular stage of its life, to the depth of water that an aqueous plant might prefer, a huge variety of information is required. "No single astronomer or biologist or atmospheric scientist could have attacked this problem individually to get the simulation," says Meadows, who is herself an astrobiologist whose original academic training was in astronomy. "So these papers are truly interdisciplinary pieces of work." The researchers focused on the way plants use light for energy to produce sugar--which is pretty much the definition of photosynthesis--because photosynthetic pigments must be adapted to the available light spectrum. The available light spectrum at a planet's surface is a result of both the light from the parent star and filtering effects of gases in the atmosphere. For example, ozone absorbs ultraviolet light, so that not much reaches Earth's surface. "It turns out that the spectrum of the number of particles of light is what is important, and on Earth there are more particles in the red," Kiang explains. "This could explain why plants here on Earth are mainly green." On Earth, plants absorb blue light because it is energetic, and red light because the photons are plentiful. 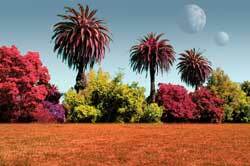 There is more than enough energy from the blue and red in sunlight, so plants do not really need more. Therefore, they reflect away relatively more green light, which is why plants appear green to us. A planet orbiting a star with the size and temperature roughly like our sun, and with Earth's particular mix of oxygen and what-have-you, would tend to have plants that like to soak up light in blue and red and less in green. But the situation could be different on other planets, where other colors of the spectrum might predominate. In those cases, another color like red might not be so useful, and the plants would mostly appear red. There are many other factors, such as the role not only ozone plays but also carbon dioxide and water vapor, how the stellar radiation creates chemical reactions in the atmosphere, whether the star is prone to solar flares, how much water is on the planet, how much light gets to the surface, what gases are produced by the plants themselves, and so on. This is why a complex computer model was necessary. Also, one might wonder what things could live on a planet with very little ozone, for example, where radiation would be a daily assault on living organisms, and energetic particles from solar winds would be like deadly microscopic bullets. Meadows says the modelers have taken such scenarios into consideration, and they think that there might be a "sweet spot" a few to tens of feet below the surface of the water where life is protected from UV radiation. "We found that the sweet spot could be up to nine meters underwater for a planet orbiting a star significantly cooler than our sun, and photosynthesis could still take place," she says. "Something with a floatation capability could be protected from solar flares and still get enough photons to carry on." In short, the new model provides a powerful tool for looking for life on other worlds, Meadows says. "We once thought that planets around other stars were exceedingly rare," she explains. "But every time telescopes have gotten better, we've been able to find more and more Jupiter-sized planets. So there's no reason to think that there aren't a huge number of Earth- sized planets out there as well. "We may not find anything like ourselves, but it's possible that bacterial life is prevalent on these Earth-like planets," Meadows adds. "If we have the environment for life to exist, then we think that it's likely that life will emerge in these conditions." The other authors of the two papers are Antigona Segura-Peralta, Giovanna Tinetti, Martin Cohen, Janet Siefert, and David Crisp, all of the Virtual Planetary Laboratory, Govindjee, of the University of Illinois, and Robert Blankenship, of Washington University. The Virtual Planetary Laboratory was formed as part of the NASA Astrobiology Institute, which was founded in 1997 as a partnership between NASA, 12 major U.S. teams, and six international consortia. NAI's goal is to promote, conduct, and lead integrated multidisciplinary astrobiology research and to train a new generation of astrobiology researchers. Il Pianeta roccioso "Aurelia" che orbita attorno Gliese 581 non Ã© solo, insieme a lui girano attorno alla stella nana rossa un pianeta gassoso pari 15volte la massa terrestre, ed uno di 8volte la massa terrestre! La scoperta fu possibile grazie a HARPS (High accuracy radial velocity Planetary searcher), uno spettrometro che riesce a "vedere" i disturbi che i pianeti esercitano sul loro sole nel orbita - appena di 9km! Il pianeta piÃº caldo finora scoperto Ã© HD149026b, nel sistema di Ercole, 279 anni luce distante dalla terra con 2038 gradi! una nana rossa Ã¨ una stella molto longeva e quindi da questo punto di vista Ã¨ una candidata ideale ad ospitare la vita. ma mi sa che sia troppo debole per dare calore sufficente ed inoltre queste stelle hanno delle crisi in cui sono molto luminose. Un pianeta appartenente alla costellazione della Vulpecula ed orbitante attorno ad una stella a circa 64 anni luce da noi, Ã¨ salito alla ribalta in questi giorni quando un gruppo di ricercatori coordinati dall'italiana Giovanna Tinetti, ha scoperto la probabile presenza sulla sua superficie di acqua. Grazie al telescopio spaziale Spitzer della NASA i ricercatori hanno osservato il pianeta mentre transitava davanti alla sua stella, analizzando i comportamenti della luce emessa dall'astro. Gli effetti ottenuti non hanno fatto altro che confermare l'ipotesi che sul pianeta vi fosse acqua. La scoperta, nonostante si sappia giÃ che il pianeta Ã¨ del tutto inospitale alla vita per via delle sue temperature, Ã¨ comunque di sicuro rilievo, soprattutto per quanto riguarda l'efficacia della tecnica utilizzata.